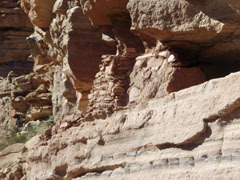 A granary structure sits perched above the base of the Tapeats. It is the end of 2011 and the weather has improved over the last ten days or so. We've had temps in the 50s in Flagstaff and I have been jumping back into some serious efforts to get into shape. A few days earlier than this hike I went up to the top of Mt. Elden, here in Flagstaff, which is just a tick under 9,300 feet in elevation (from 7,000 foot Flagstaff). It felt good and the trail was fine. 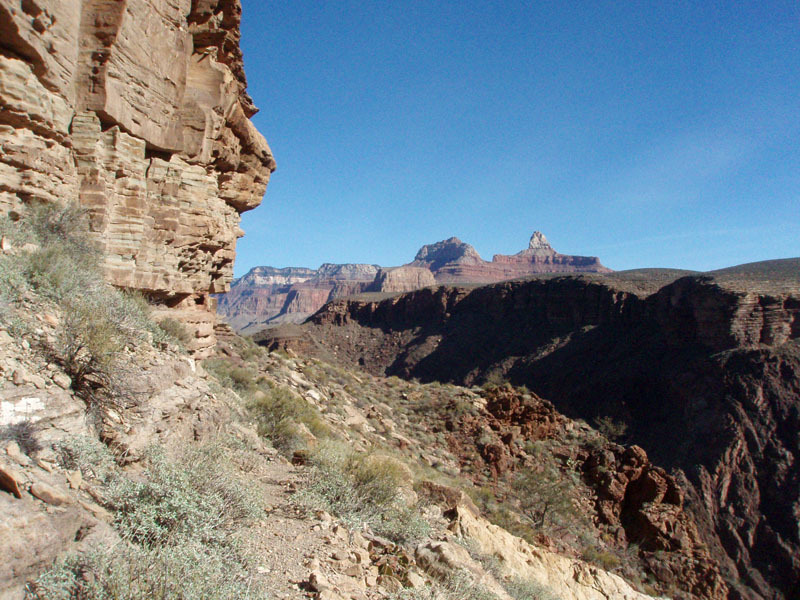 So, I decided to do a hike down the Bright Angel trail. 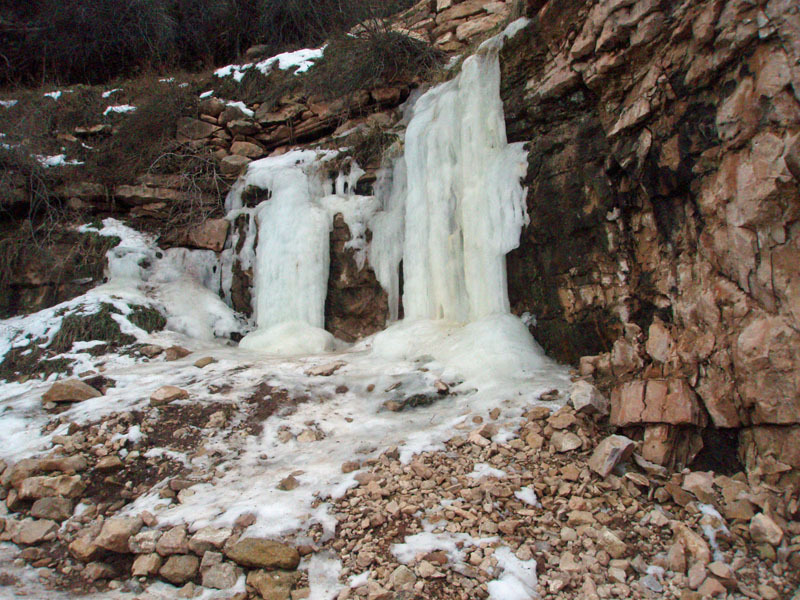 I knew that the trail would be icy, and I was not disappointed. But, I also knew that it would be a nice warm day down in the canyon and that there wouldn't be too many folks on the trail. I left town a bit late, at almost 7 a.m., and pulled into the dirt lot behind the Bright Angel Lodge at 8:20 a.m. Twenty minutes later, and wearing my Kahtoola Microspikes, I was off. I passed a few small groups trying to negotiate the trail without any crampons and doing quite poorly. 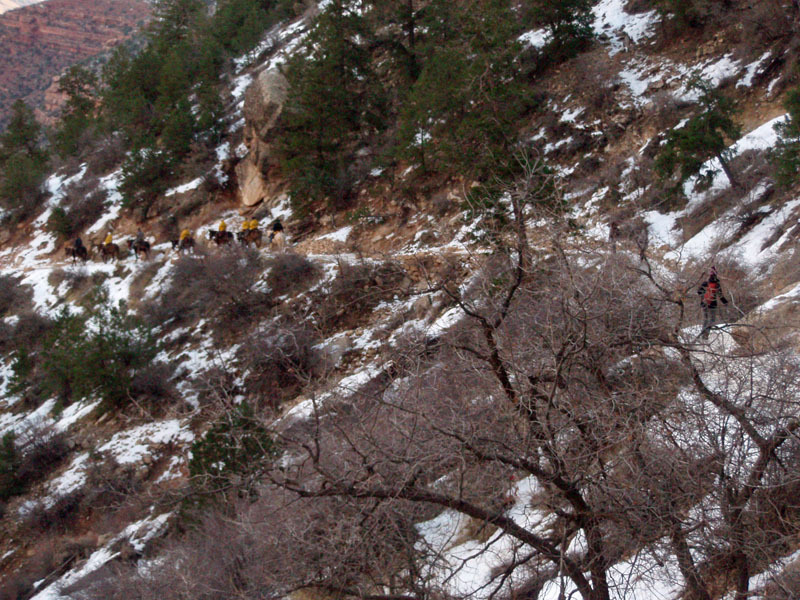 A small group were on the mules headed to Phantom Ranch and they were about a half mile ahead of me (at the first switchback). Apparently, the mules are also equipped with some special shoes that give them good footing on the ice. 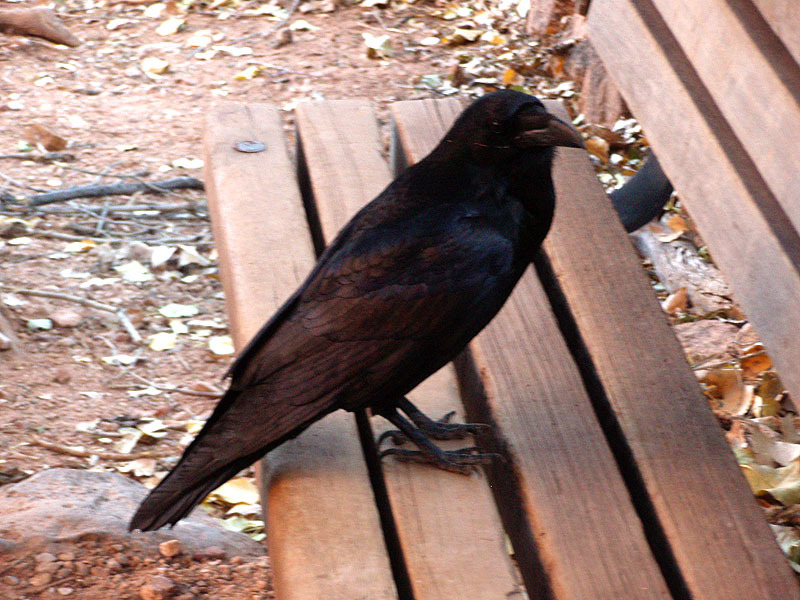 I got close to them a few times but never caught up, although they were at Indian Garden when I arrived and I got to chat with a few of these visitors. It took me 38 minutes to reach the 1.5 mile resthouse, 37 minutes to reach the 3 mile resthouse and 35 more minutes to reach Indian Garden. Pretty good time considering the ice. But, I didn't feel slowed up at all - the microspikes worked great. 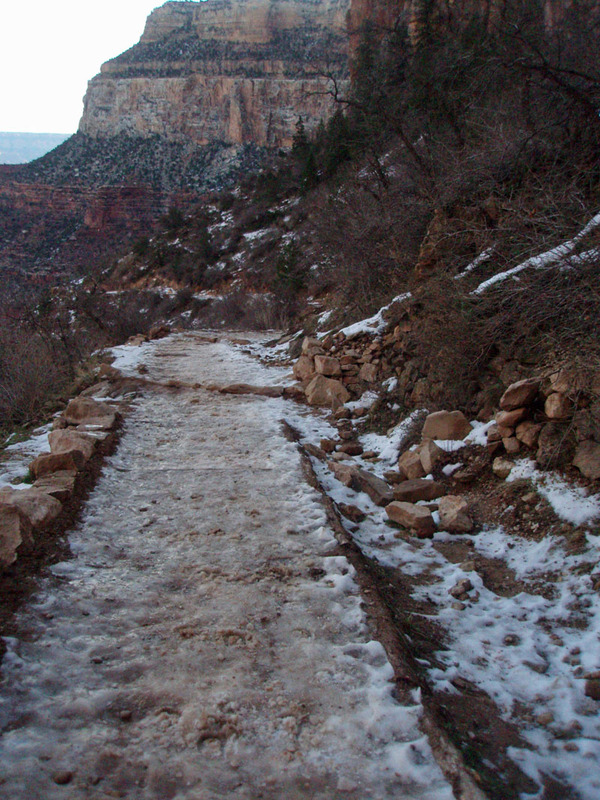 At about 2.5 miles down I did take them off as the trail had mostly lost all its ice. It was shady all the way down and rather cool. I wore only my fleece coat, but took it off when I took off my microspikes. But, I left on my earband (is that what it's really called?). 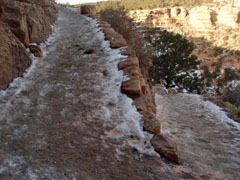 The Bright Angel trail was mostly ice with some hard-packed snow. Crampons were a must and I passed quite a few people trying to negotiate the trail without these aids. Small group headed to Phantom. Icy trail continued to 3 mile house. 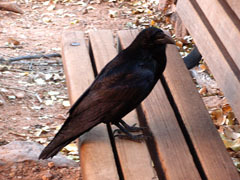 A brazen visitor at Indian Garden. I arrived at Indian Garden at 10:30 a.m. and stayed only about ten minutes. I had thought that I might hike all the way to the river and back for this trip. 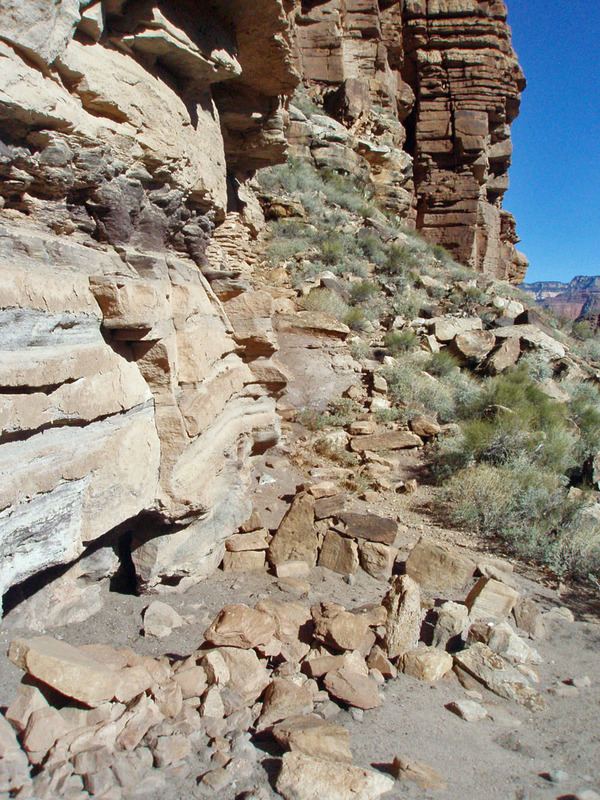 But, I have often wanted to spend time scouting out the ruins that you can see when following the old Bright Angel trail, at the base of the Tapeats cliffs. 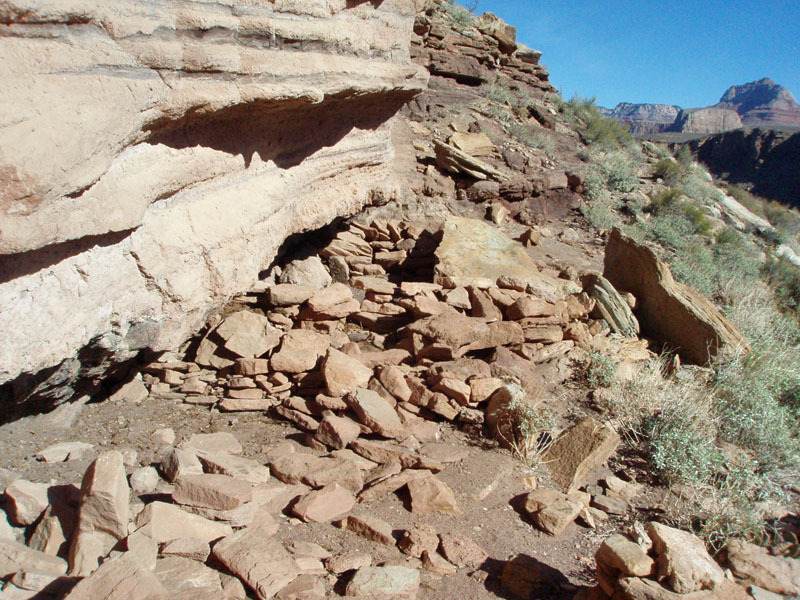 So, I copied out a couple of pages from Wayne Tomasi's great book, Grand Canyon Hiking Adventures about these ruins. 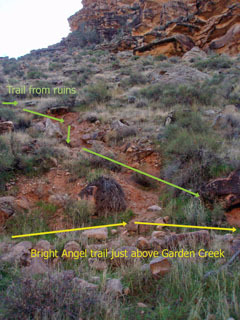 He writes that the ravine that the old trail follows to get through the Tapeats had been referred to as "Bright Angel Wash" by some old-timers. I have never heard of any name for this ravine, so I will adopt this name. 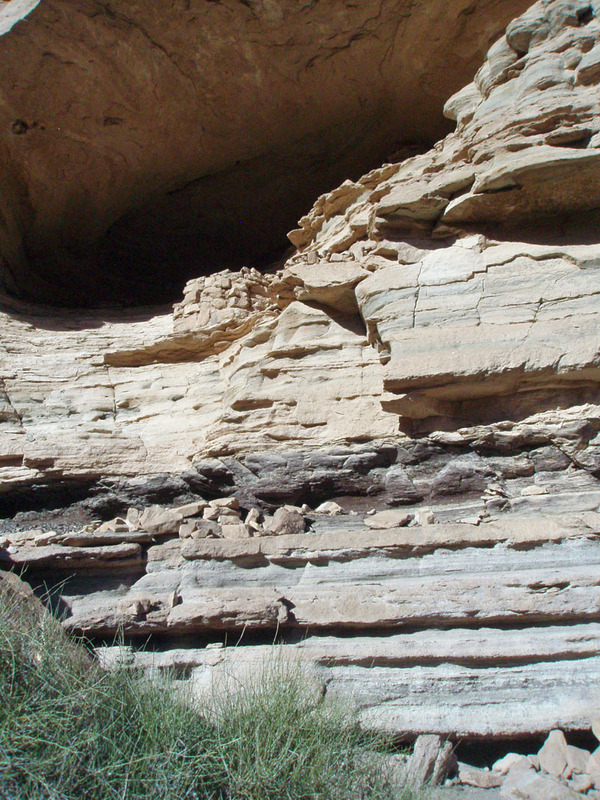 [He also noted that it was also called Salt Creek, but there already is one of those.] 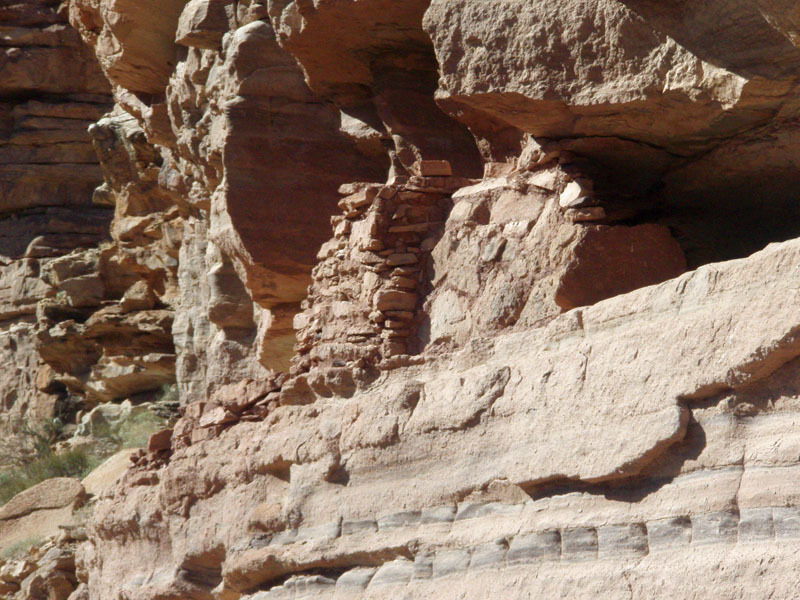 As I was hiking down to Indian Garden I decided that my scouting out of these ruins would be my primary objective and getting to the river a back-burner possibility. I have been down this old trail a number of times. At least, through the Tapeats. 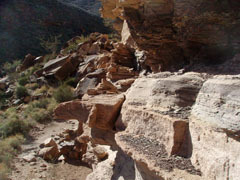 It meets up with the current trail at a spot that used to have a trailside sign describing the "Polished Rock" that is present here. 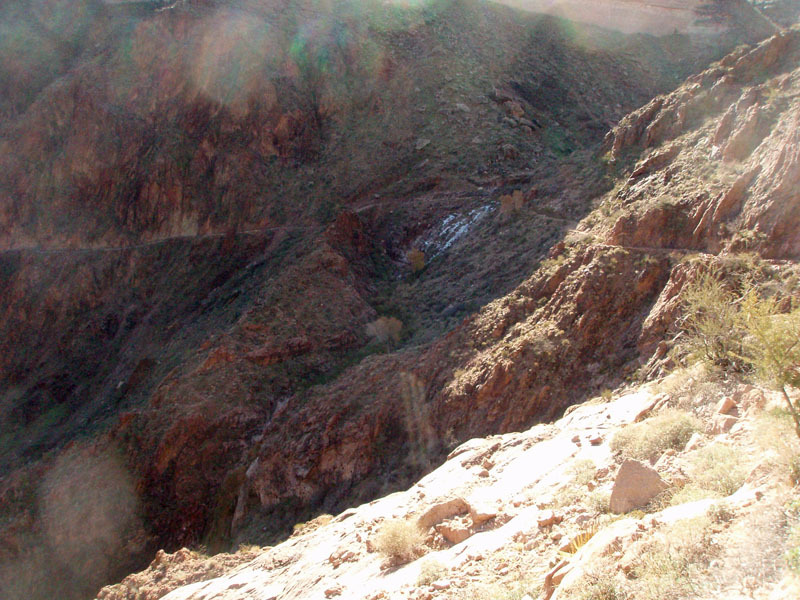 Then, it descends steeply along what was called the "Devil's Corkscrew." I have only covered the corkscrew part once, and that was coming up. 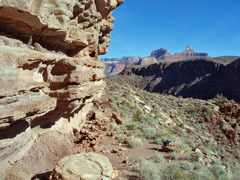 The old trail, through Bright Angel Wash, is easy to follow and is in great shape, and I am sure it is faster than the current trail. 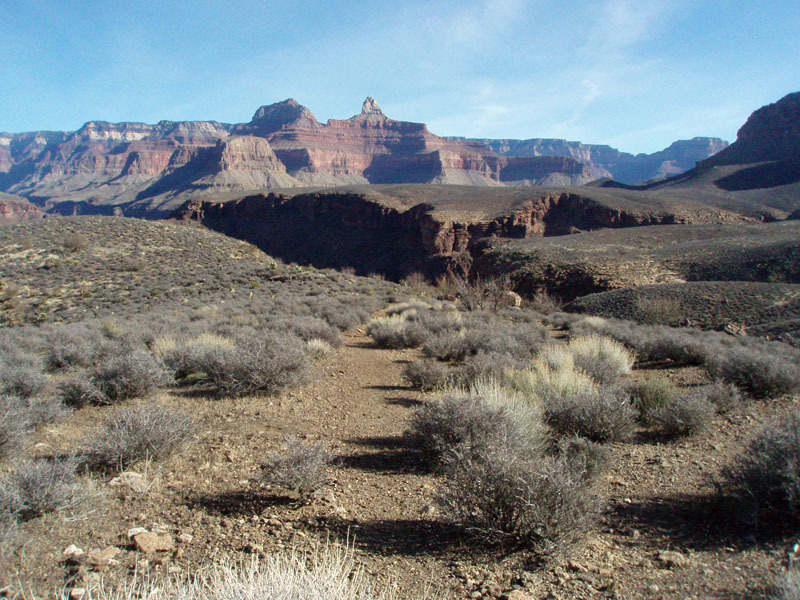 To get to it, you have to take the Tonto trail to the east, out of Indian Garden. 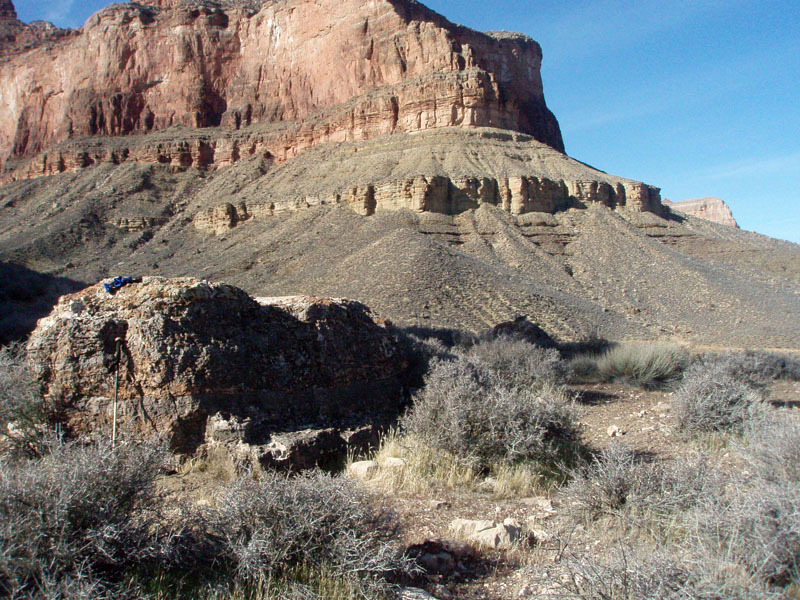 It climbs up to the plateau and once it flattens out, you leave. 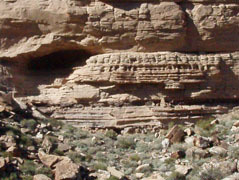 There are two very large squarish boulders here and you can still discern a faint trail heading straight for Zoroaster Temple (see the photo below). The old trail may have some bushes growing up to block some spots, but you can easily pick out the rock outline of the trail. 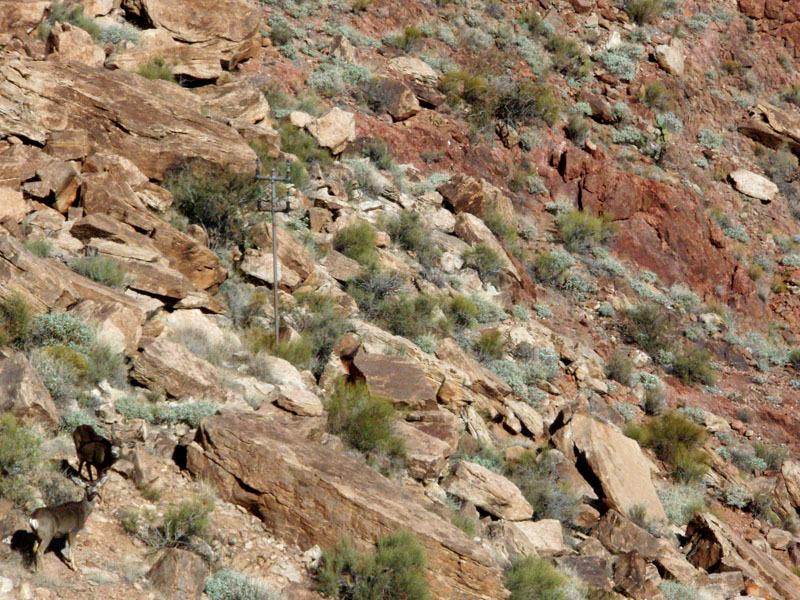 Also, you soon come to some telephone poles that no longer function but used to provide phone service to Phantom Ranch. 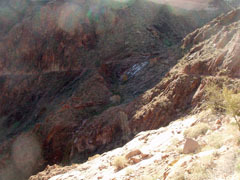 [I once used it at Phantom Ranch to call my supervisor to let him know I was going to be late returning from my hike. I had planned to go from Grandview to PR in one day and that didn't work out! That was in 1979.] 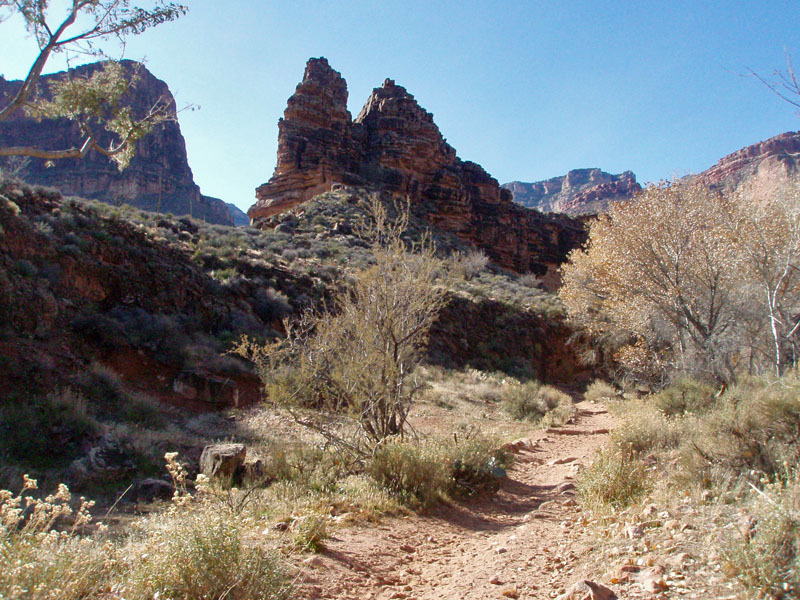 Tomasi writes about a trail that heads over to the ruins but I missed it. 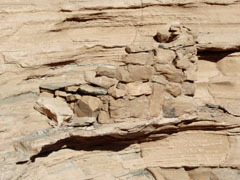 Once I came down to the bed and contoured along the east side of the wash, I could make out something faint on the opposite hillside. But rather than backtrack I continued down to the junction with the drainage coming in from the east. The trail drops back down to the bed and from here I climbed up the hillside to the first set of ruins. 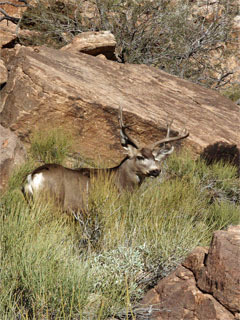 But, just before reaching the bed I heard a noise and saw a deer bounding away. Then I saw another one. Then three. Altogether there were six in here browsing. They mostly kept their distance from me as I made my way up to the ruins. Two boulders mark old trail. Old BA heads north along Tonto. As I neared the junction with another ravine I heard noises and found there were six deer browsing here, some with decent antlers..
Two deer near old phone line. 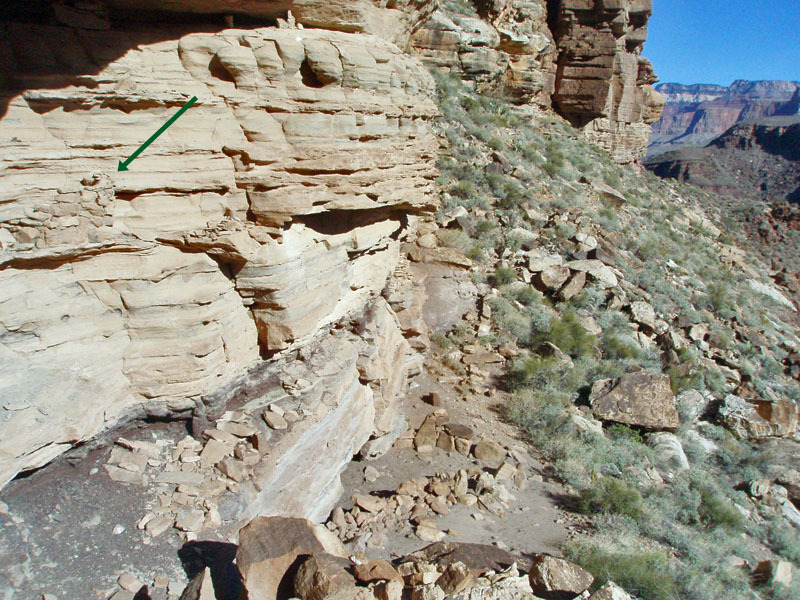 As I neared the base of the Tapeats cliffs I saw a clear trail coming to this spot from up the wash. As is usual, trails often appear rather indistinct unless you're right on them! 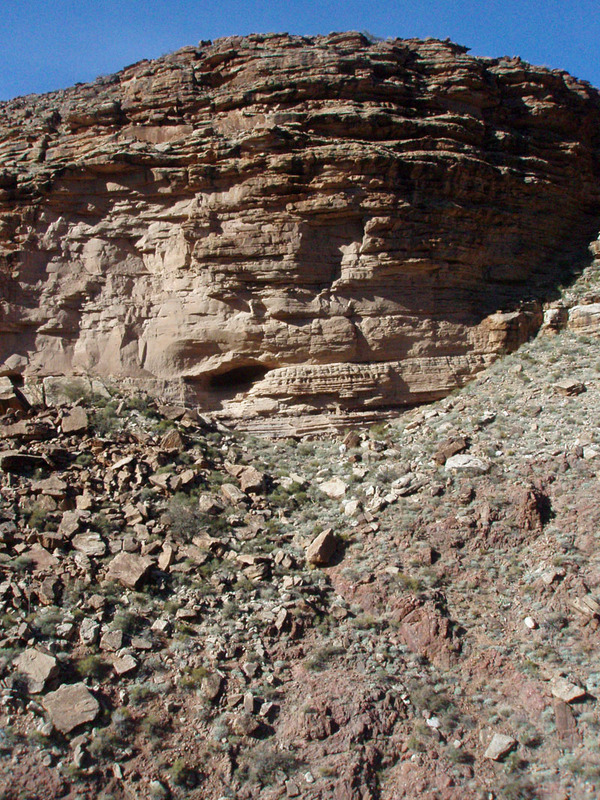 The route led up and over some fallen Tapeats slabs to what I have called the "cave site ruins." 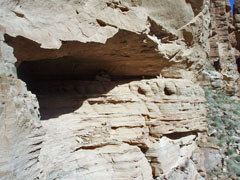 There is a great partial structure hanging on the wall on the narrowest of ledges in this little cave. 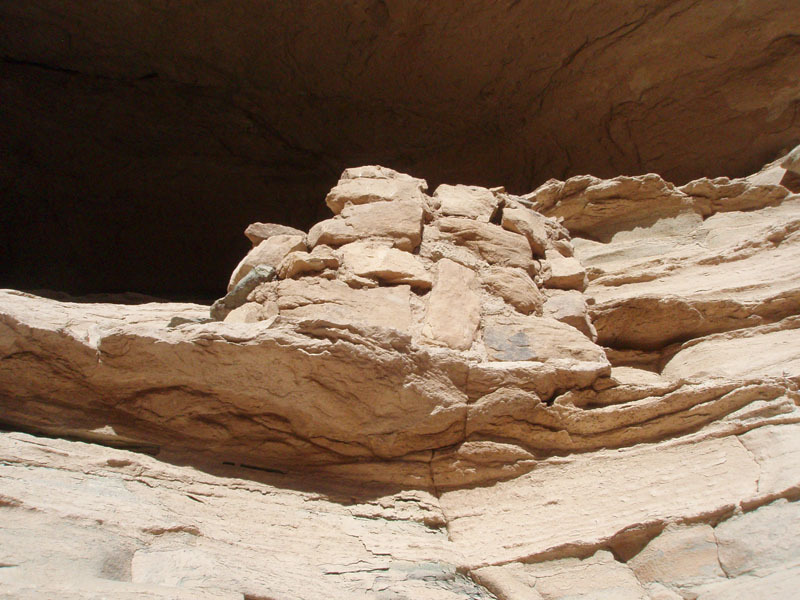 Two other partial granaries are near the top of this cave and another structure in the back. 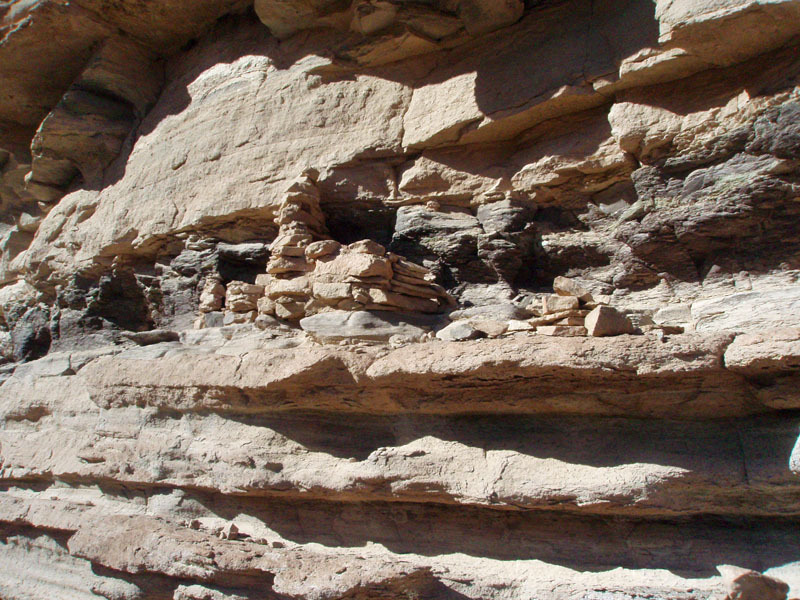 Down below, at the base of the cliff, are some dwelling units, whose walls still outline these structures. Also, another granary is located here on a ledge about ten feet above the ground. 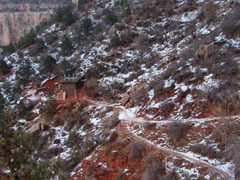 From here the trail crosses a hillside to another set of ruins. 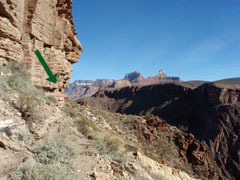 I found a faint trail heading up this hillside and Tomasi notes that one can follow the crack in the cliff back up to the Tonto level. 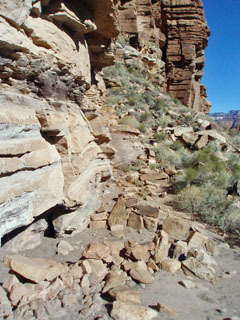 The spur trail to the ruins is in really excellent condition, although exactly where it leaves the old trail eluded me. 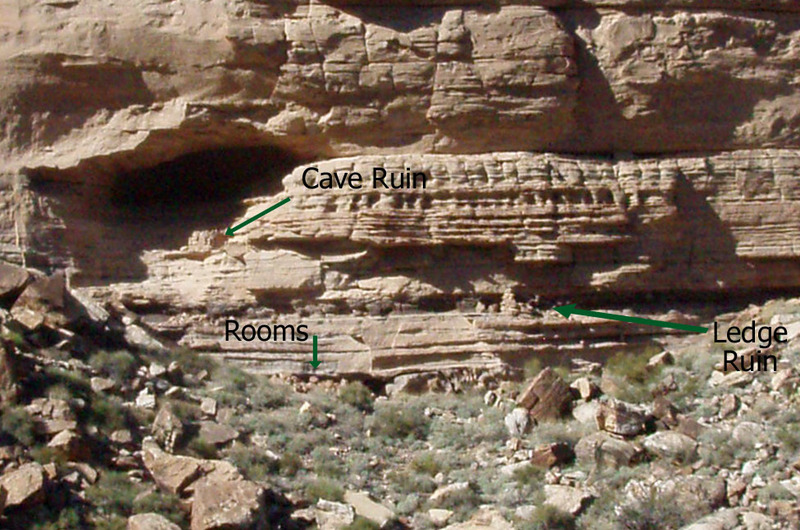 Parts of 4 ruins in this shallow cave. 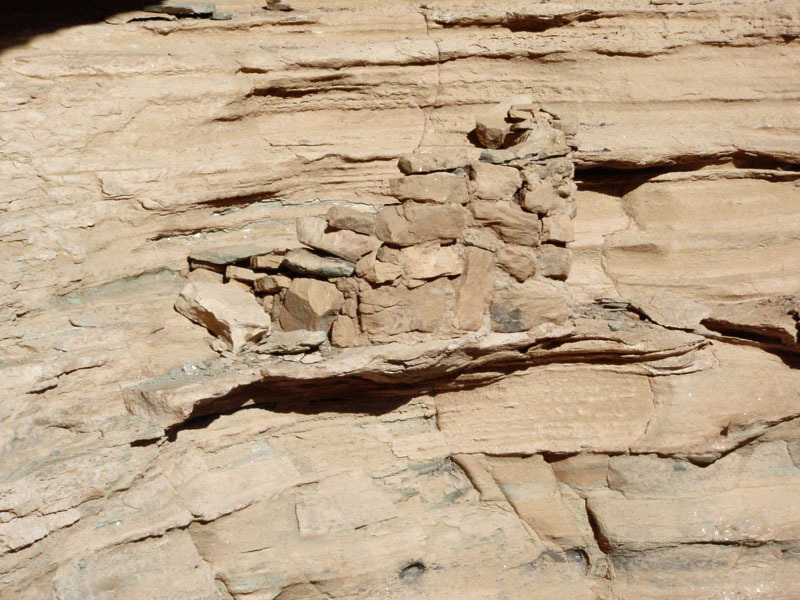 Main ruin perched on narrow ledge. 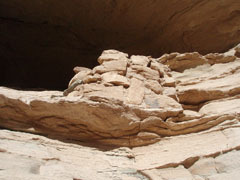 Looking up at main cave ruin. Remains of some bigger, residential ruins at the cave site. 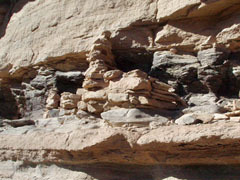 Note that there is a granary on the ledge above and is also shown in other photos to the right. 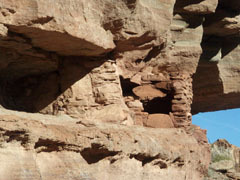 Ledge granary at cave site. Looking at the open side of the ruin. A short distance away are more ruins, which I have dubbed as the "northern ruins site." 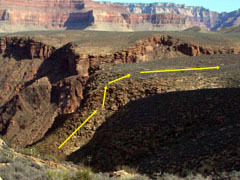 This is where the Tapeats end, and form an impressive point when looking back up this direction. 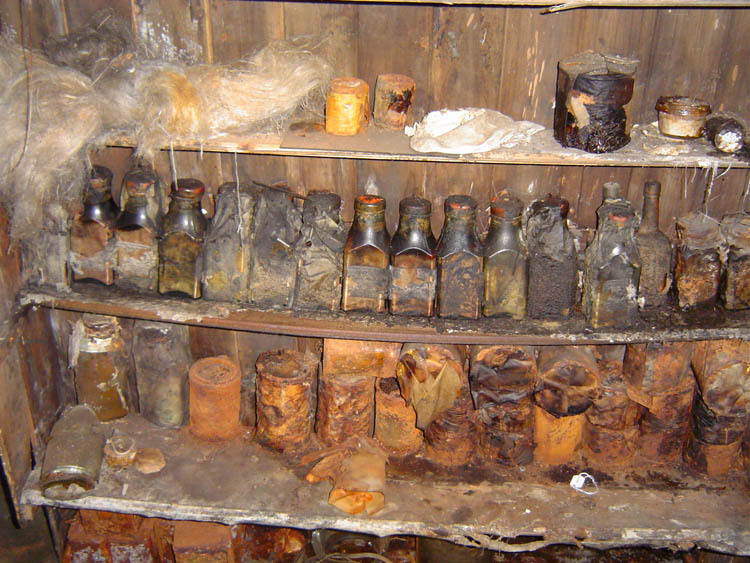 There are more dwelling units here and a well-built ledge granary. 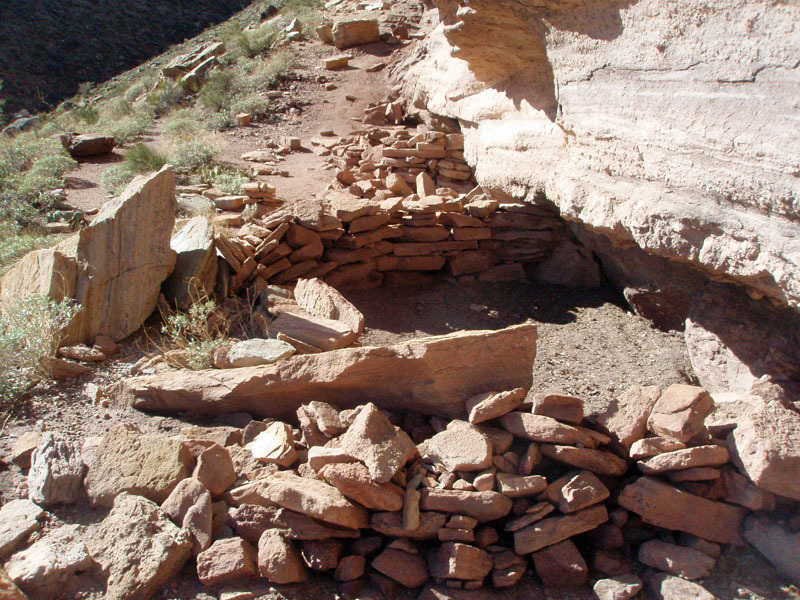 This structure is quite visible from the old trail and it has been one of the reasons I wanted to see it up close and personal. 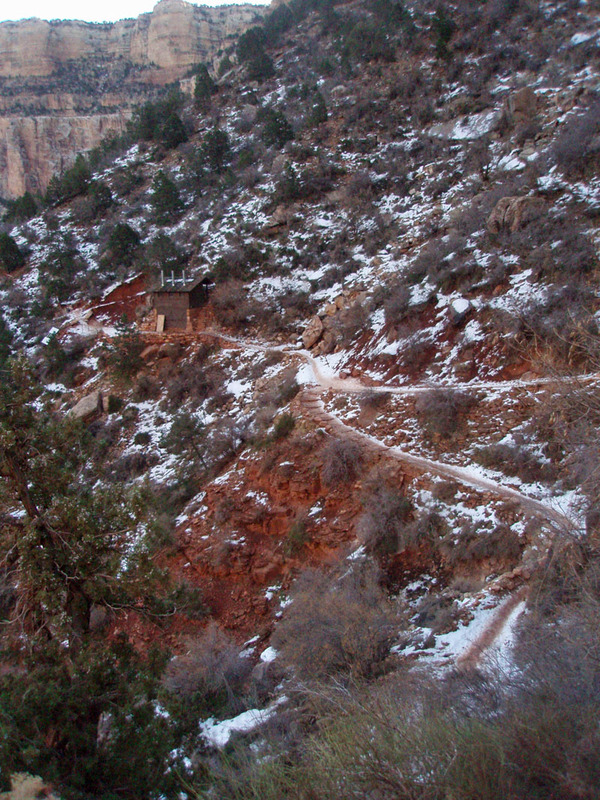 There is photo of it from another trip I wrote about where we traveled down this old trail (The Winter Side of Phantom Ranch). From here I had a real good view of the old trail down below me as it quickly reaches the current trail at the polished rock. The trail continues to the northern ruins here at the base of the Tapeats. This view is looking back to the cave ruins site. A faint trail headed up this hill to the right. Does it exit? 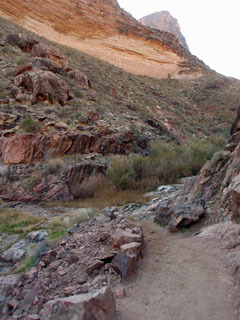 View of old trail in the wash. 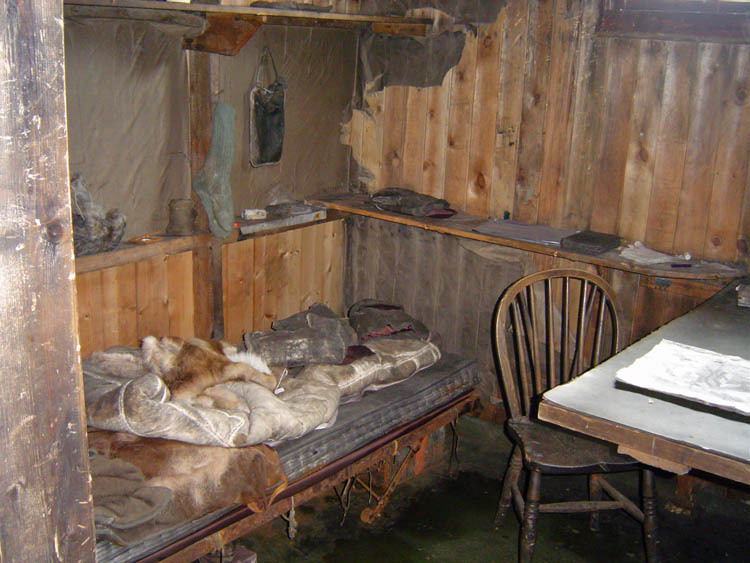 Living quarters at northern ruins. 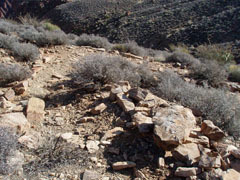 View looking south at the northern ruins in Bright Angel Wash. This is the end of the east-facing Tapeats. The current trail, alongside Garden Creek is only a few minutes away. 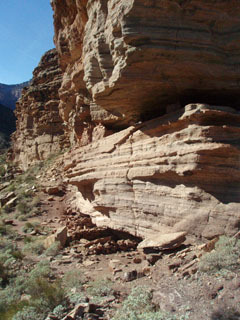 Cliff granary can be seen from trail. Looking back at cliff granary. 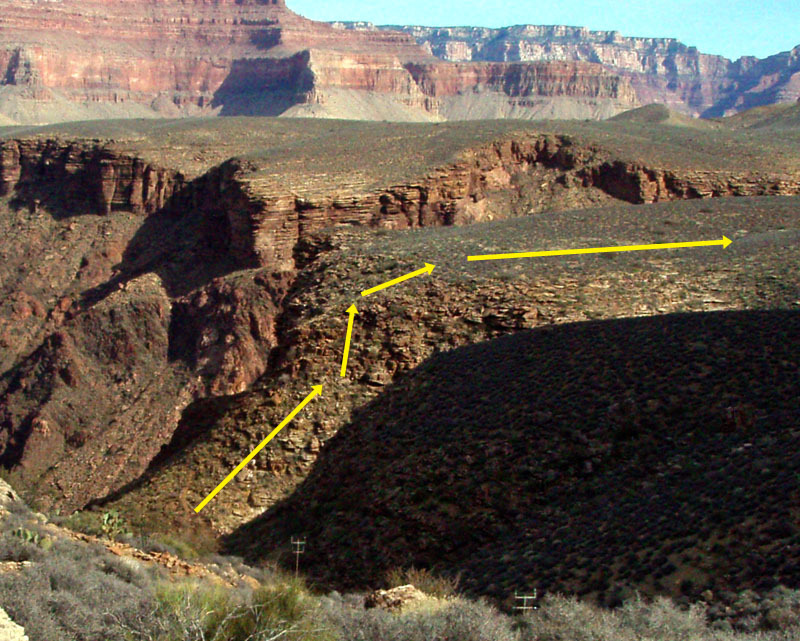 At 12 noon I rounded the corner of these Tapeats cliffs and angled back to the current trail as it follows alongside Garden Creek. 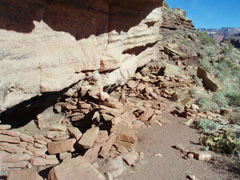 Nearby is a route up to the west to some more ruins, which I have written about before (The Garden Creek Ruins). While my tour of these ruins only took about an hour, I decided that I would be pushing my luck to get down to the river and then back out before dark. I did bring along my headlamp, but really wanted to drive back home well before midnight on New Year's Eve! 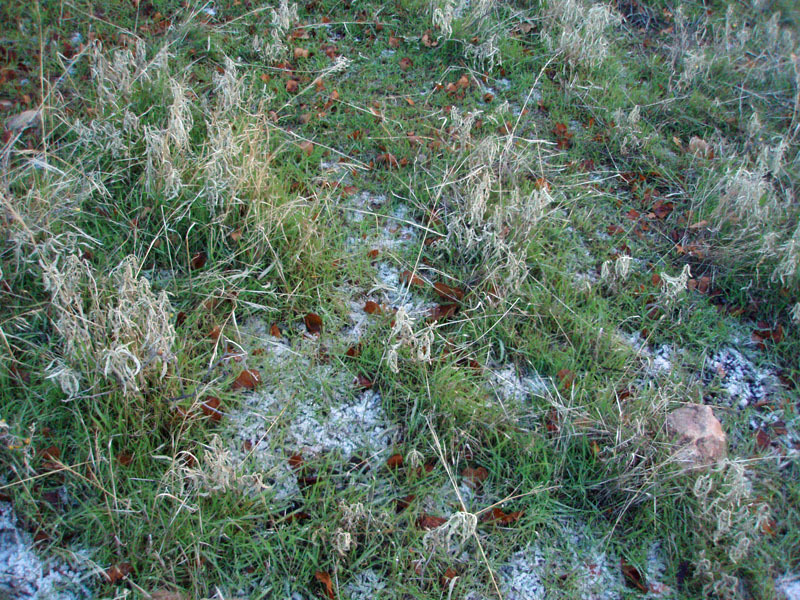 Surprising to me was that there were icy crystals in the grasses here. 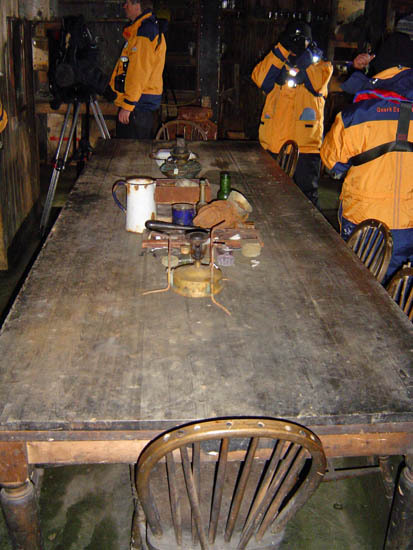 The area seems to be in perpetual winter shade and is probably a cold sink as well. 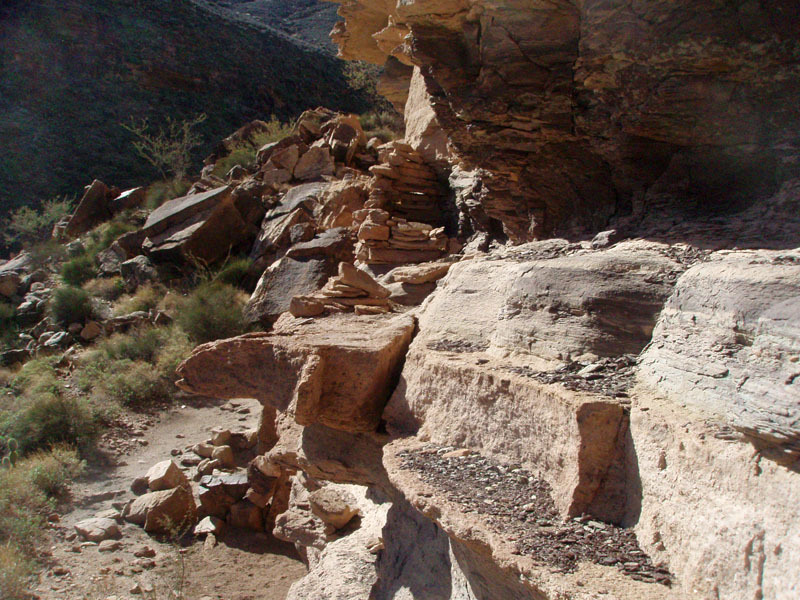 I followed the trail down to the old polished rock site, where the old trail crosses. 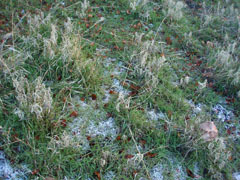 There was ice here as well! 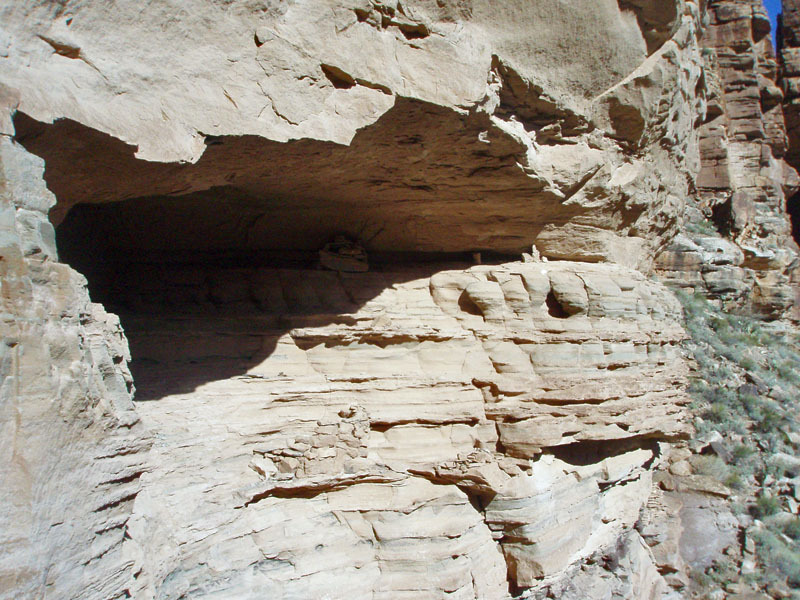 There is usually a trickle here, which is probably why the rocks are polished. 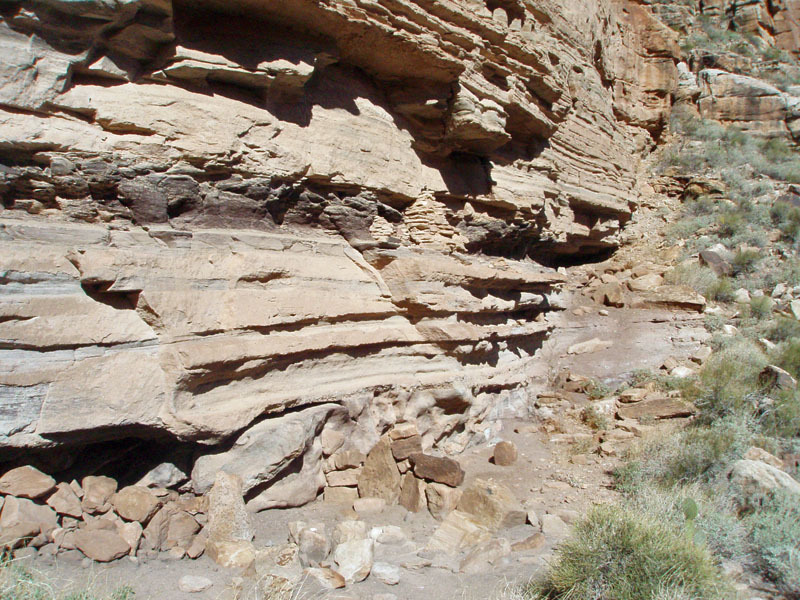 There was water flowing today, and it was coming out of the other major ravine here. Worth checking out sometime. I stopped here for lunch and soon two hikers came down the old trail - Chris and Scott from Prescott. They were rather surprised to be following my boot tracks over much of the route. 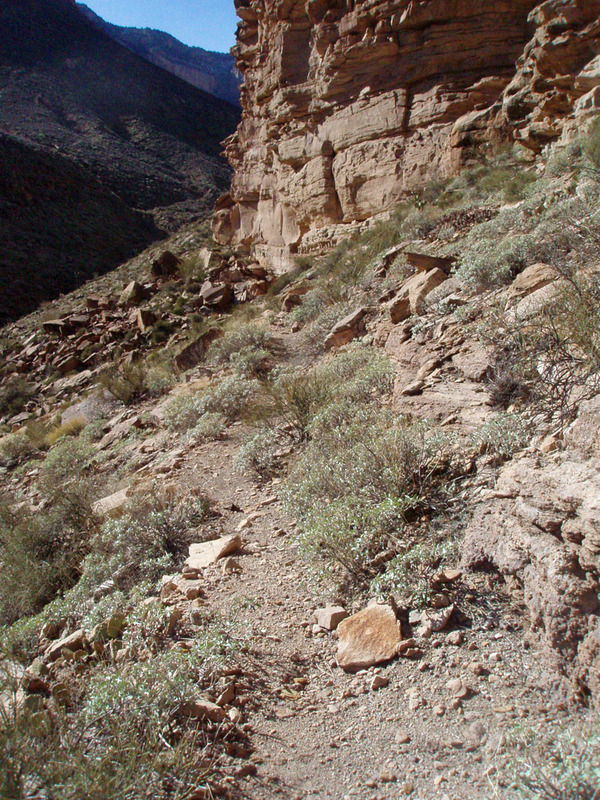 They were heading to the Bright Angel campground and were going to continue with the old trail down the original "Devil's Corkscrew." After my lunch was done, at 12:40 p.m., I headed back up the old trail. 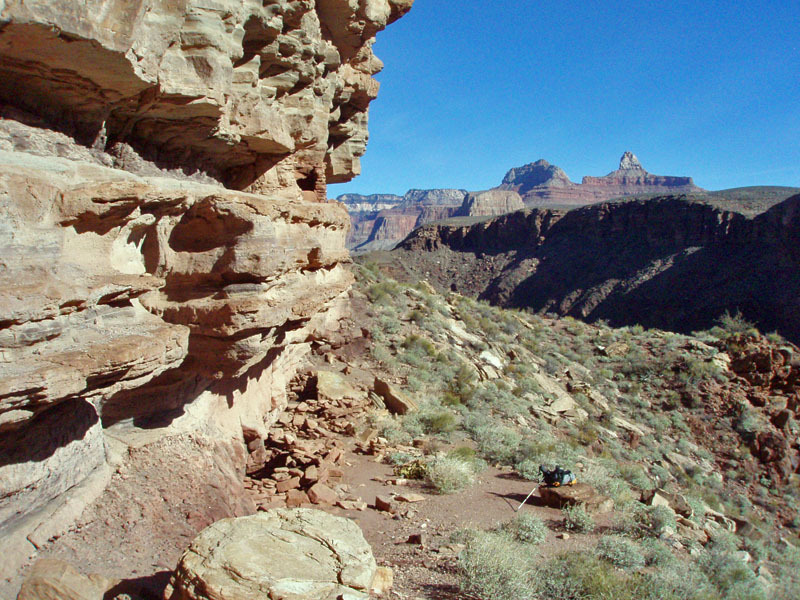 The point at the end of the Tonto serves as a majestic backdrop to the site of these ruins in the Bright Angel Wash. 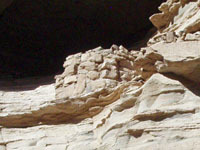 The cliff granary can be seen on the ledge on the lower left side. The spur trail wraps around the end of the protruding Tonto point and angles down to the current trail. The final 15 feet are really a small gully. The view from further down the trail. The current trail crosses the old trail at a site that was called "Polished Rock." Looking to the SSE the sheer Tapeats cliff is impressive as is the lone tree growing at the base (is it a pine?). 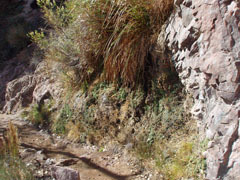 Another water bar along the old trail. The trail is discernable as it heads up the Bright Angel Wash. 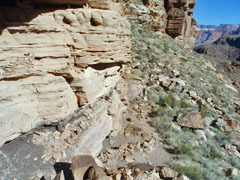 In the background is the south rim and the Battleship formation. Water bar on old trail. 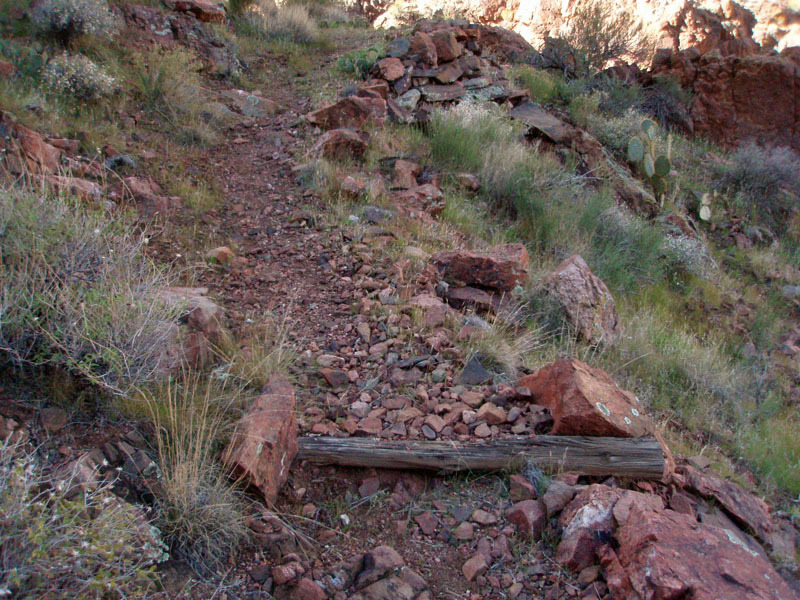 As noted earlier, the trail is real easy to follow. Indeed, there are still some logs in place to serve as diverters of water. There was still at least one deer up here grazing and still pretty much ignoring me. 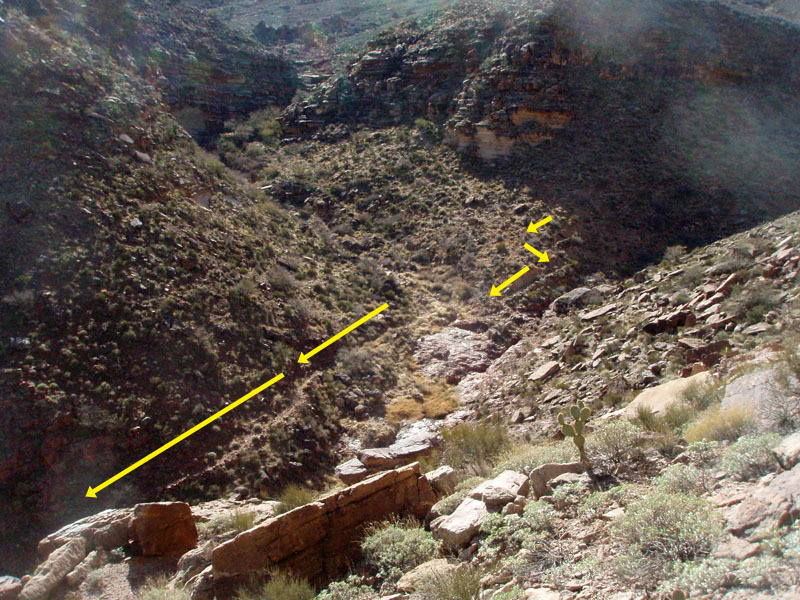 As I reached the junction with the other drainage, I could spy a route up to the Tonto along the north side of this ravine. 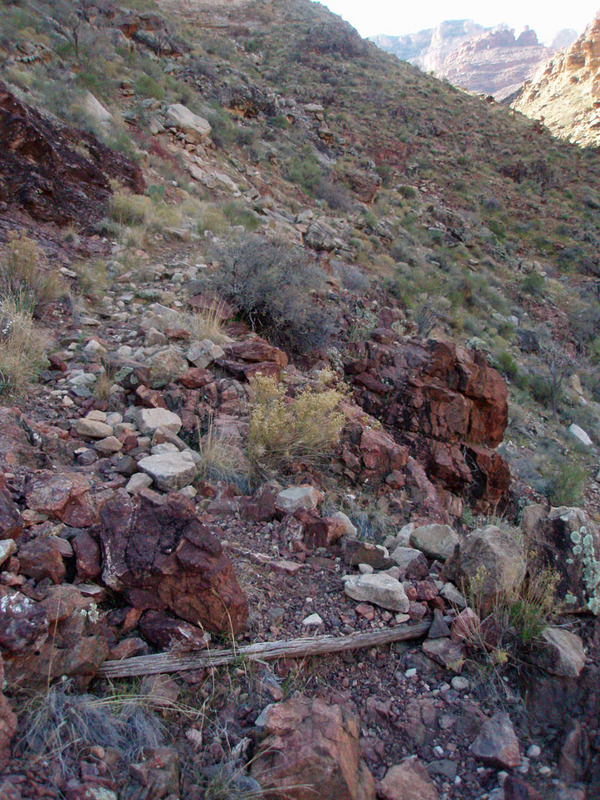 When I reached a good spot, just before the trail goes down to the bed, I headed up the nose of this point and soon found myself up on top of the Tonto. Nice little climb. 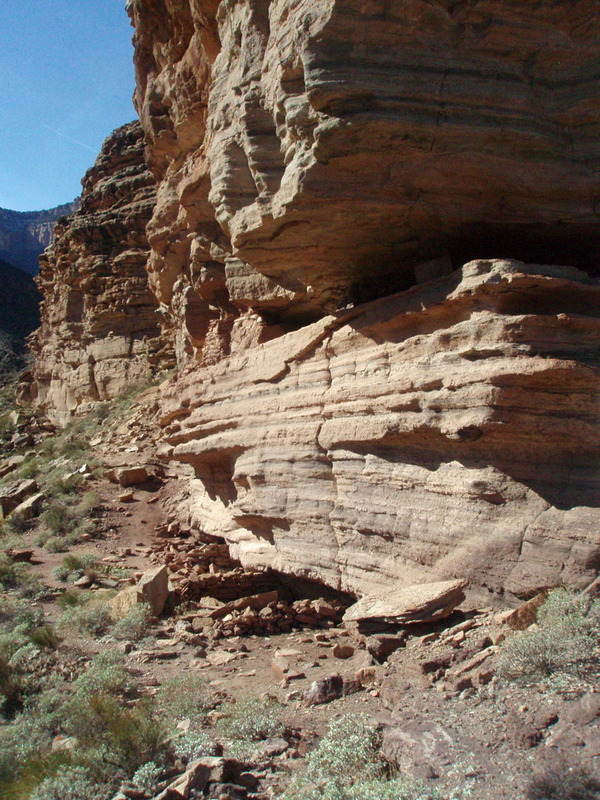 And, it afforded me a chance to really get a good panorama of the ruin sites and the trails here. 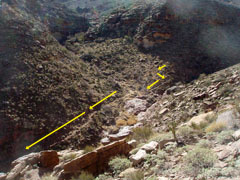 The photo below shows all of this, with the yellow lines marking the old trail and the mauve lines showing the spur trail that goes to the ruins. 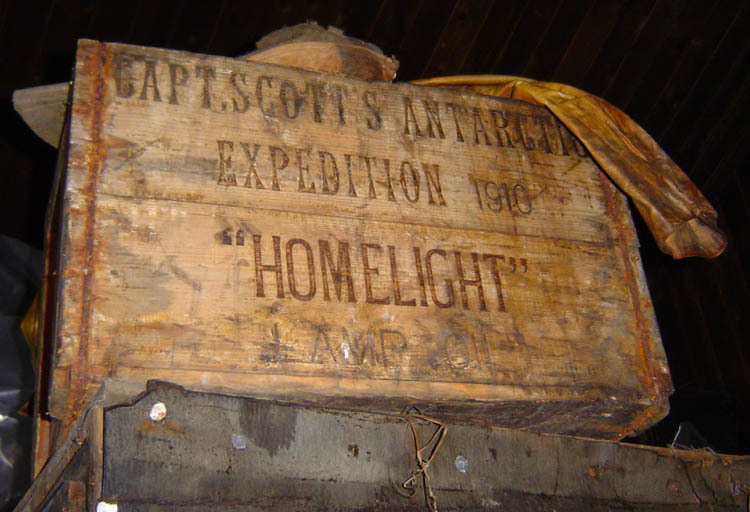 Click on the photo to see a larger image. 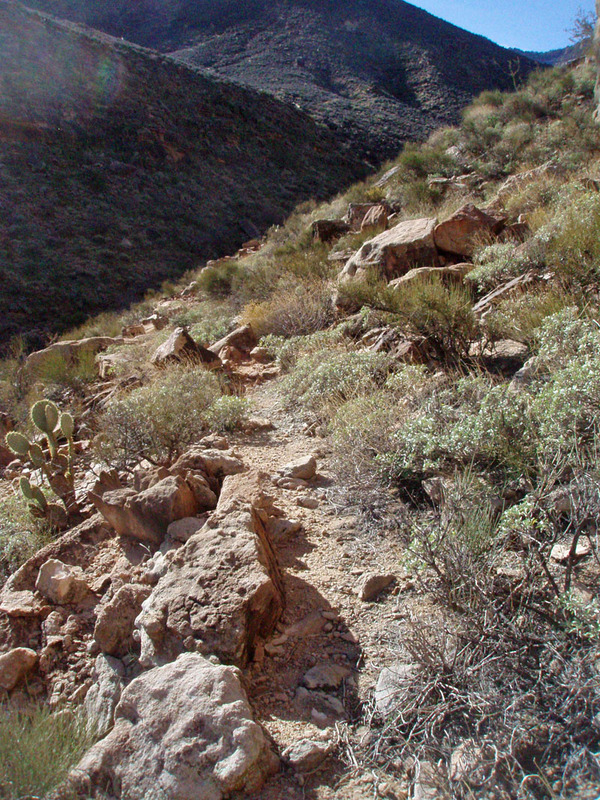 From the Tonto, I had to hike back to the trail. It was further away than I would have thought. 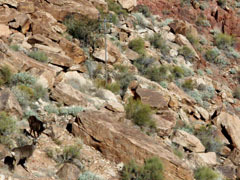 Lucky for me, there were two hikers on the trail so I could see where I needed to go and was able to pick a good route. By 1:46 I was back at Indian Garden. I stayed for about ten minutes and then started up. There were quite a few hikers here and there along the trail, pretty much heading up as well. I felt in good shape and got to the 3 mile resthouse in 45 minutes, then up to the 1.5 mile resthouse in 42 minutes and to the top in another 55 minutes, all quite acceptable to me! I was able to hold off on wearing the microspikes until I reached the 1.5 mile resthouse, and while I put my earband back on, I didn't have to wear my coat the rest of the hike. The exit route I followed. Seep spring near "Polished Rock." 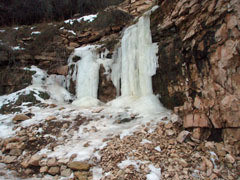 Icy waterfalls at Kolb Seep. I reached my truck at 4:20 p.m. and was soon on my way . . . to stop at the pizza place in Tusayan so I could get a large hot wing pizza to go. I got home at 6:20 p.m. and despite my best intentions to stay up to ring in the New Year, I gave up at 9 p.m. 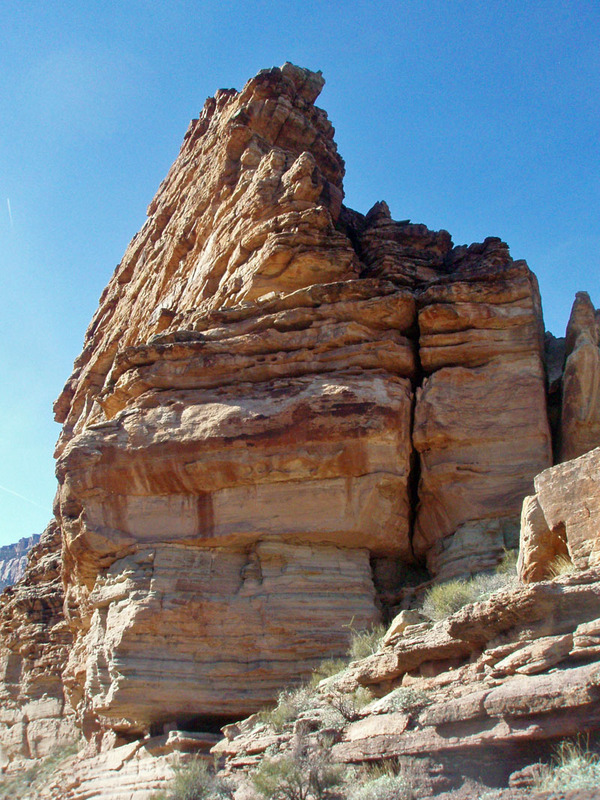 So it goes after a good hike in the canyon!